A key turning point that validates why we have created our non-lethal defense system. The data shows we have reached a level of violence that requires action. Threat Extinguisher has been striving to save lives during a hostile intruder or active shooter event after the founders determined the violence was not going to end, and doing nothing for them was not an option. Threat Extinguisher helps our schools and companies empower their staff to make decisive decisions faster by proving them with powerful communication, a call to outside help earlier in an event, and with a proven-effective option for defense (more than throwing just whatever is at hand). Per the new government database, their calculations show 2018 has already seen the most school shootings in nearly 50 years (this is when the database begins). 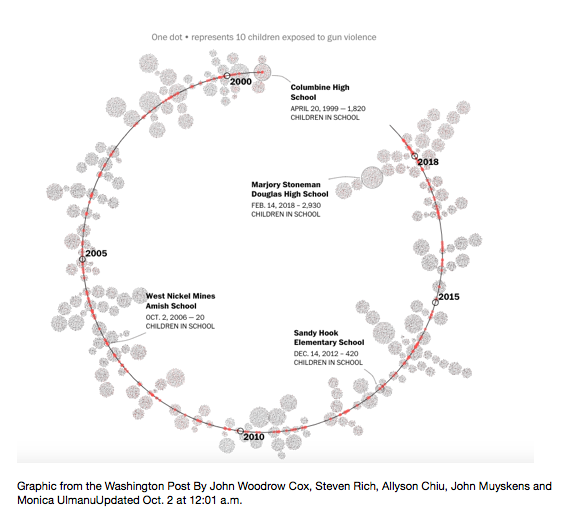 More than 215,000 students have experienced gun violence at school since Columbine High School Shooting in 1999. The researchers ultimately decided to include each and every instance a gun is brandished, is fired, or a bullet hits school property for any reason, regardless of the number of victims, time of day, or day of week. So now that we have the data, what will we do with it? Our goal is that we can finally agree there is not one solution. We need a multi-faceted approach. We need to be aware of those around us, to assess and address our friends and family that are struggling may be in need of help. We need to take a layered approach to how we allow people to access many of our spaces. From controlled access(ID systems, perimeter door locks, window films) to practicing emergency drills, having additional tools for when a situation deteriorates into violence, like interior door barricade devices, communication options. Threat Extinguisher uses technology that automates the communication process by simply removing a canister from its base. Having the information to lock-down/shelter-in-place/exit-to-a-safe-zone more quickly saves lives and reduces the trauma to all of those on the premises. All of the layers in a security program are designed to buy time to save lives. If you are a school in Ohio, you can visit us for a free demo at the upcoming OSBA conference. Click below if you’d like more information, a free demo and quote.